Deer Mountain Wood Art: Fire Rainbow! 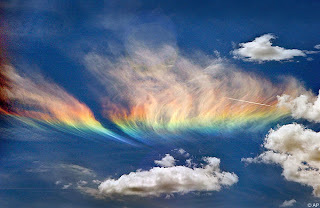 I thought I'd pass along something my bil sent me this morning - it's a "Fire Rainbow" and is very rare - The description with the picture states, "This is the rarest of all naturally occurring atmospheric phenomena. The picture was captured on the Idaho/Washington border and lasted about an hour. Clouds have to be cirrus, at least 20K in the air, with just the right amount of ice crystals, and the sun has to hit the clouds at precisely 58 degrees." That's a LOT of requirements! !lol I guess that's why it's so rare =D enjoy the picture! The "Antler Tumbling" experiment has been declared a failure this morning =< style="font-style: italic;">did change the surface of most of the assorted junk in there, for the most part, it was very little and I gave up... I guess that's why they make Dremels!? Have much on the table this morning, but thought I would share this pretty picture - I don't think I've ever heard of a "Fire Rainbow" let alone seen a picture of one - pretty darn cool. New Video Tutorial Viewer Added! one, two, three, she's out! "Don't go near the light!..." Just WHAT are we trying to say here?? "Don't try this at home"! I'm on an Etsy Treasury!